Alcoholics Anonymous is a worldwide fellowship of alcoholic men and women who are banded together to solve their common problems and to help fellow sufferers in recovery from that age-old, baffling malady, alcoholism. The only requirement for membership is a desire to stop drinking. 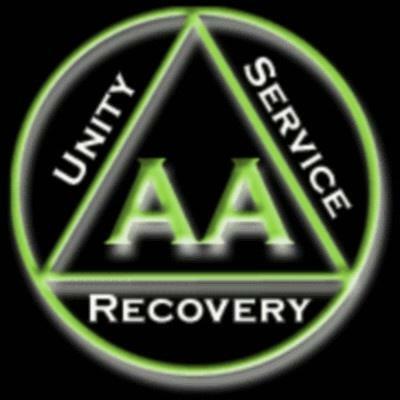 There are no dues or fees for AA membership. Sobriety is maintained through the sharing of experience, strength, and hope, either individual to individual or at group meetings and through the 12 Steps. Alcoholics Anonymous is not a religious society. A.A. does not inquire into alcoholics’ religious beliefs—or lack of them—when they turn to the Fellowship for help. However, the A.A. program of recovery is based on certain spiritual values. Individual members are free to interpret these values as they think best, or not to think about them at all. If you need help with a drinking problem contact us through our answering service @ 866-309-1090.
or e-mail AA using the form on the Contact AA page. or find us at one of our meeting places. A list of our meeting places and times is on the Contact, AA Meetings and Find a Meeting pages. More information is available in more detail in literature published by A.A. World Services, Inc. click here. Receive additional information by e-mailing District 18 AA on our Contact Page click here. The District 18 Committee is made up of General Service Representatives from the AA Groups that serve Grove City, Slippery Rock, Harrisville and Blacktown, Pa .
Excerpt from The Language of the Heart,Bill W's Grapevine Writings: pg. 41,2nd and 3rd paragraphs; "Nowhere in A.A. is there to be seen any constituted human authority that can compel an A.A. Group to do anything. Some A.A. Groups for example, elect their leaders. But even with such a mandate, each leader soon discovers that while he can always guide by example or persuasion he can never boss, else at election time he may find himself passed by. The majority of A.A. Groups do not even choose leaders. They prefer rotating committees to handle their simple affairs. These committees are invariably regarded as servants, they have only the authorization to serve never to command. Each committee carries out what it believes to be the wishes of each group. That is all." Excerpt from the Twelve Steps And Twelve Traditions, pg.174, 4th paragraph: "It is clear now that we ought never to name boards to govern us, but it is equally clear that we shall always need to authorize workers to serve us. It is the difference between the spirit of vested authority and the spirit of service, two concepts that are sometimes poles apart. It is in this spirit of service that we elect the A.A. groups informal rotating committee, the Intergroup Association for the Area, and the General Service Conference of Alcoholics Anonymous for A.A. as a whole." So in it's simplest form, committees are a tool for A.A. Groups to use to handle their affairs. District Committees, Area Committees, Intergroup Committees, Central Office Committees, Answering Service Committees, Spaghetti Dinner Committees, Sober Events Committee, etc. The District Committee ( 18 ) and it's corresponding Area Committee ( 60 ) are part of the General Service Conference which links A.A. Groups to A.A. as a whole. A District is a geographical unit containing the right number of Groups - right in the terms of the committee members ability to keep in frequent touch with them, to learn their problems, and to find ways to contribute to their growth and well being. The General Service Conference is the structure by which A.A.'s services are carried out. From Bill W. - A.A.'s legacy of service, our 12 Step , carrying the Message is the basic service that our fellowship gives, this is our principal aim and the main reason for our existence. Therefor A.A. is more than a set of principles, it is a society of alcoholics in action. We must carry the message, else we ourselves can wither and those who haven't been given the truth may die. Hence an A.A. service is anything whatever that helps us to reach a fellow sufferer - ranging all the way from the 12 Step itself to a 10 cent cup of coffee and to A.A.'s General Service Office for National and International action. The sum total of all the services is our Third Legacy of service. The GSR ( General Service Representative ) has the job of linking his or her Group with A.A. as a whole. The GSR represents the voice of the Group conscience, reporting the Groups thoughts to the DCM ( District Committee Member ) and to the Delegate who passes them on to the Conference. This communication is a two way street, making the GSR responsible for bringing back to the Group, Conference actions that affect A.A. unity, health and growth. Only when a GSR keeps the Group informed and communicates the Group conscience can the Conference truly act for A.A. as a whole. The DCM ( District Committee Member ) is an essential link between the GSR and the Area Delegate to the General Service Conference. As leader of the District Committee made up of all GSRs in the District, the DCM is exposed to the Group conscience of that District. As a member of the Area Committee he or she is able to pass on the Districts thinking to the Delegate and the Area Committee. 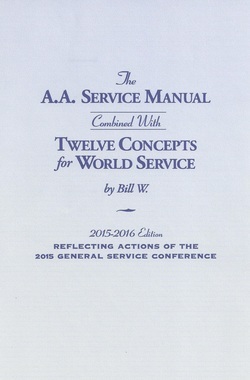 Service Manual and Workbooks for Committees are available for Download and / or Printing from A.A. World Services by clicking on the picture. Special needs can be helped by learning American Sign Language, click here. Excerpts, reprinted from A.A. Literature with permission of A.A. World Services, Inc.
To Visit A.A. World Services Website click here www.AA.org .